Joel A. Katz (above left) talks with Wally Curran on opening night of the exhibit. The collection is located on the Tunnel level of the Winship building on the Clifton campus. 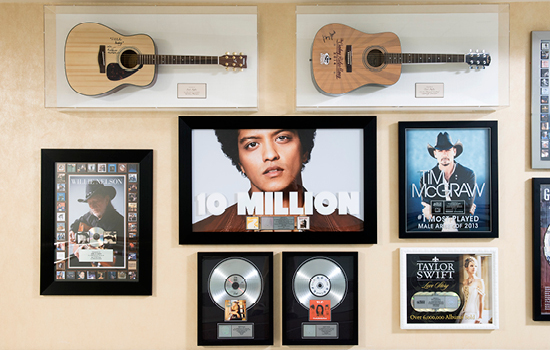 Platinum records, autographed guitars, and hand-written lyrics from some of the biggest names in the music industry are part of a priceless collection of memorabilia donated to Winship Cancer Institute by Joel A. Katz, a global entertainment and media attorney of Greenberg Traurig, LLP in Atlanta. The Joel A. Katz Music is Medicine Collection, now on display at Winship and open to the public, is considered one of the most musically diverse collections ever assembled in any hospital. 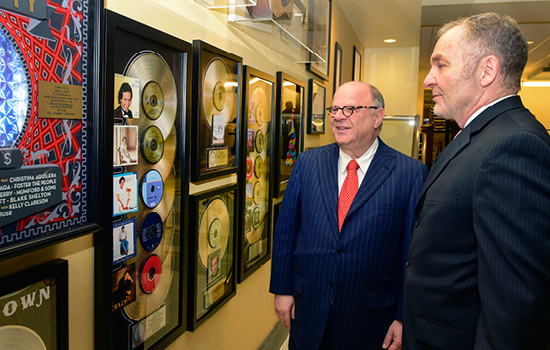 The gift coincides with the T.J. Martell Foundation's establishment of The Joel A. Katz Music is Medicine Fund, which provides support for innovative cancer research at Winship. 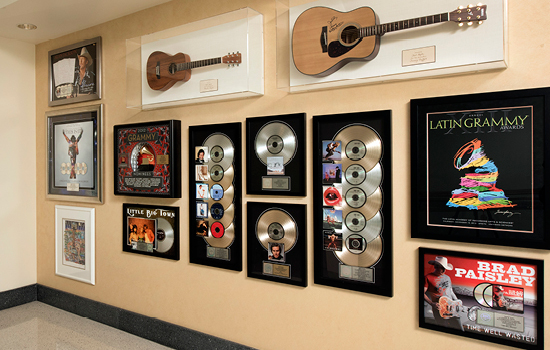 Patients, caregivers, and visitors have the rare opportunity to view the three dozen items on display including multiplatinum commemorations of worldwide record sales for Michael Jackson, Julio Iglesias, and Georgia native James Brown; guitars signed by Paul McCartney, Willie Nelson, and George Strait; a 2012 Grammy nominees award plaque; and handwritten lyrics from country star Alan Jackson. The comprehensive collection of music history spans decades and genres including rock, pop, hip-hop, and country.